It was easy to lose sight of it in the excitement of an early knockdown and a devastating finish last December. Two men in the flush of their physical prime, still young and hungry and without miles piled on by time, were putting on quite a sophisticated show. The action in between the most memorable moments of Jermall Charlo’s IBF 154 lb. title defense against Julian Williams was beautiful to watch. There was speed, aggression, and technique. They were, in spots, countering each other’s counters as they played a most violent chess. Charlo scored checkmate in five rounds and was off to chase middleweight glory. It was a young man’s fight. Boxing is often at its very best when we get the best of those. Nothing against the aging fighter, and this is of course dabbling in generalization, but the ways fighters win as they age can change. We see more paced approaches, more clinches, and more strategic offensive output. It can be smarter, but its not always more exciting. Younger men, in their eagerness and with less experience, make mistakes. They get caught. The drama ensues. If a younger man is good enough, they can force their physicality on the more learned older fighter. Pitted with another young foe, the unpredictability of the game can increase. This Saturday on Showtime (10 PM EST/7 PM PST), we have a clash of younger men and two other fights where younger men attempt to remove their elders. It’s part of a broader movement of new or at least still fresh feeling names and faces in multiple divisions right now. Few have the depth we find at Jr. middleweight. The main event it is the most likely place to see the established head of the division remain for now. 34-year old WBA titlist Erislandy Lara (24-2-2, 14 KO) is a favorite over 30-year old 2012 US Olympian Terrell Gausha (20-0, 9 KO). Even if he wins, it won’t be long before the men on the undercard this weekend are ready to try to move him off the stage. Unlike Lara, 32-year old former WBA titlist Austin Trout (30-3, 17 KO) is not seen as a favorite. 27-year old IBF titlist Jarrett Hurd (20-0, 14 KO) is making his first defense but this isn’t a case where he is seen as unchallenged. Trout was competitive with Jermall Charlo in 2015 and before that won four in a row after consecutive losses to Canelo Alvarez and Lara. Trout is far from an old fighter. He confronts Hurd with more experience, a solid chin, and ring intelligence. No one with a win over Trout has proved to be anything less than the real deal. If Hurd can win this weekend, it will be a win that grows his reputation. It could also be a win that makes people want to see Hurd with more of the brightest faces of his class. Given the style of both fighters, the real red meat on this card will be the pure young man’s game. 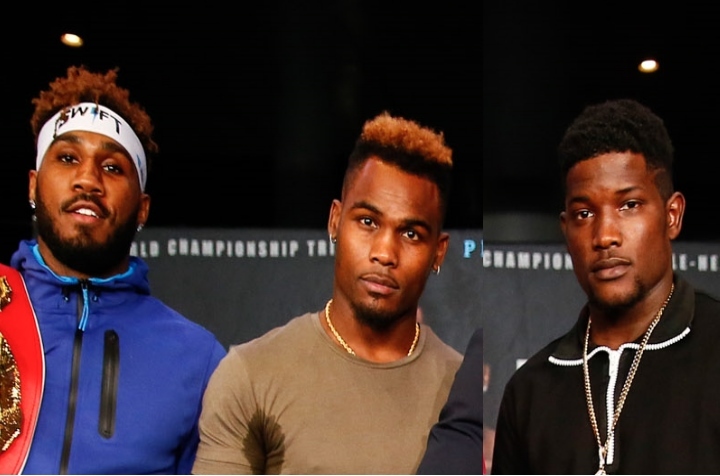 27-year old WBC titlist Jermell Charlo (29-0, 14 KO), the twin brother of Jermall, will attempt his second defense against one of the most interesting rising talents in the game. One can question whether 22-year old Erickson Lubin (18-0, 13 KO) is being moved too soon. Time is on his side and there isn’t much need to hurry. That is unless he’s ready now and then why wait at all. Lubin isn’t as professionally experienced as Charlo and may not yet be in his prime. Charlo is physically about as peak as he’s ever going to be. It’s a gamble both ways. Charlo is a name in boxing circles but hasn’t quite touched the mainstream yet. Lubin is a threat to derail him before he and his brother can figure out how best to cash in as twin terrors of the middleweights. A loss to Charlo could set Lubin back a year or two. That sounds like the recipe for a hell of a fight. If there’s something to lose, there’s something to fight for. When the smoke clears, we are guaranteed to have one, with the possibility of three, undefeated men in the class 30 years of younger with their stock at an all time high. From there, we can dream about the mixing and matching at Jr. middleweight or even middleweight down the road with the likes of Jermall, Canelo Alvarez, Demtrius Andrade, or Gennady Golovkin. And does anyone think newly minted IBF welterweight titlist Errol Spence won’t grow into at least Jr. middleweight sooner than later. Charlo, Lubin, and Hurd are all still playing the young man’s game in their careers. If enough youth is served this weekend, there will be as much to look forward to in the months and years ahead as there is in this single well-stacked card. Man this sounds like fun, makes me wish I had Showtime. Easy fights all night. Haymon house fighters. Even if an opponent fights well enough to win the judgesare in the bag. Only this time them boys that always b*tching will keep their mouths shut. Lara, Hurd and Charlo will win their respective fights....Lubin won't get to the 12th round.